My name is Xuanhe Zhao, and I'm a first year student in DEAS. Before joining Harvard, I got my Master Degree in Materials Engineering from University of British Columbia, Canand. I have took one course on Computational Mechanics, and read a couple of books on theory of elasticity. The major goal for me taking ES 240 is to learn how to understand and solve engineering problems, both familiar and unfamiliar, in a intuitive way. In addition, I will further consolidate my background in solid mechanics. I am a first year grad student in bioengineering working in Dr. Parker's Disesase Biophysics Group (http://www.deas.harvard.edu/diseasebiophysics/). I attended Washington University in St. Louis for undergrad, where I double majored in biomedical engineering and biology and minored in chemistry. The only courses I have taken related to solid mechanics are Biomechanics and Transport Phenomena, both of which covered basic mechanics. As an undergrad, I worked in a research lab that focused on cardiac electrophysiology. The lab I am in now is interested in how the mechanical and electrical behaviors of cardiac cells are related, so I need to gain a stronger background in mechanics to match my background in electrophysiology. I hope that this class will help me develop an intuition about the mechanical behavior of objects, which I can apply to the mechanics of cellular events. I completed my undergraduate degree in Mechanical Engineering at The Cooper Union for the Advancement of Science and Art, in New York City. At the undergraduate level, I have taken two courses related to solid mechanics: Solid Mechanics and Stress & Applied Elasticity. Though these courses covered most of the same topics, the focus was not on working with developing the equations for different situations. The majority of the work was in knowing when to apply the equations and coming up with quantitative solutions. Thus my weaknesses will be related to coming up with equations to model various stress situations. Concerning my research, I am working with Prof. Robert Wood in the microrobotics laboratory. My focus will be on aquatic robots on the order of several centimeters in length. Because of the restrictions inherent in working at this scale, it will be important not to over-design the systems. From studying solid mechanics, I hope to gain the ability to analyze the states of stress and strain in materials such that I can effectively develop efficient systems for microrobotics. My name is Will Adams and I am a first year grad student in BME. I have no previous courses in solid mechanics or strength of materials but I have taken two fluid mechanics courses, ES220 and ES123, as an undergrad which contain many of the same lines of thinking. Hopefully the math formalisms of these classes will help in ES240 but having no solids background leaves me with little intuition about experimental results. Hopefully I can acquire this here. I was a BME major as an undergrad here in DEAS. My name is Adrian Podpirka and I am a first year grad student studying applied physics. I came to Harvard after finishing my Bachelors in Material Science and Engineering at Columbia University. As an undergraduate I took Mechanics of Solids with Professor Xi Chen and Mechanical Properties of Materials with Professor Noyan. Related to this course, my main weakness is the mathematics involved since it has been more then 3 years since I took differential equations. Also, both my undergraduate courses were not tensor based. My main strength in this course would be my understanding of material properties and the phenomenas involved. My likely research direction will probably be in the field of fuel cell membranes with Professor Ramanathan. 12. The coefficient of thermal expansion (CTE) is a second-rank tensor. The Department of Mechanical Engineering, University of Michigan, Ann Arbor, invites applications for tenure-track faculty positions in various areas of mechanical engineering including design and manufacturing, dynamics, systems and controls, materials and solid mechanics and thermal/fluid sciences. Candidates with research interests in automotive engineering, biotechnology, eco/sustainable systems, energy-systems, manufacturing, and micro/nano systems are particularly encouraged to apply. Applicants should have an earned Ph.D. in Mechanical Engineering or related fields, a demonstrated record for conducting independent research, and the potential for leadership and impact in teaching and research. Appointments at all levels will be considered. For best consideration, candidates should apply by February 28, 2007, but the positions will remain open until filled. OSTEONECROSIS is the death of bone that results in the collapse of the bony structure, leading to joint pain, bone destruction, and loss of function. Destruction of the bone frequently is severe enough to require joint replacement surgery. Osteonecrosis is a common disorder and accounts for 10% or more of the 500,000 total joint replacement procedures performed annually in the United States. Approximately 75% of patients with osteonecrosis are between 30 and 60 years of age. From the point of view of mechanics, osteonecrosis means deterioration of mechanical properties of the bone. Decrease of the magnitude of the elastic modulus of the bone leads to its inability to bear the external load and culminates in bone damage and fracturing. For a couple of decades the engineers were trying to estimate the critical stress-strain state of the femoral head using the available data on the osteonecrotic bone properties, finite element analysis based on 3D elasticity, and Von Mises stress as a criticality condition. The fact that the cortical shell of the femoral head is significantly stiffer than the underlying cancellous bone did not attract much attention yet. However, from the solid mechanics point of view the difference in the stiffness of the cortical and cancellous parts of the femoral head under both normal and necrotic conditions is important. This difference allows for considering the femoral head as an elastic cortical shell on an elastic cancellous foundation. This, in its turn, suggests the buckling of the cortical shell as a possible starting point of the overall head collapse. The purpose of the study, described here, was to assess the cortical shell buckling scenario as a possible mechanism of the femoral head collapse at the various stages of osteonecrosis. 6. Post an entry in iMechanica to explain to your teaching staff and classmates why you take this class. Valid for every week except special notification is published. The Aim of ICCES'07 is to bring researchers from the world's acdemia, industry, and the governments, for a few days, to the ambience of Miami, USA, in January 2007, to discuss the recent advances in computational and experimental engineering & sciences, and to facilitate collaborative research efforts. See an accompanying powerpoint presentation: The aged-rejuvenation-glue-liquid (ARGL) shear band model has been proposed for bulk metallic glasses (Acta Mater. 54 (2006) 4293), based on small-scale molecular dynamics simulations and thermomechanical analysis. The model predicts the existence of a critical lengthscale ~100 nm and timescale ~100 ps, above which melting occurs in shear-alienated glass. Large-scale molecular dynamics simulations with up to 5 million atoms have directly verified these predictions. When the applied stress exceeds the glue traction (computed separately before), we indeed observe maturation of the shear band embryo into bona fide shear crack, accompanied by melting. The deadline of October 1, 2006 for my program of Mechanics & Structures of Materials was inadvertently omitted in our website. However, at the beginning of our CMS home page there are 2 deadlines listed for all programs. In the meantime any unsolicited proposals for my program, please put in GPG 04-23 as the Program Announcement [1st box]. In the 2nd box put in my program name [Mechanics & Structures of Materials]. 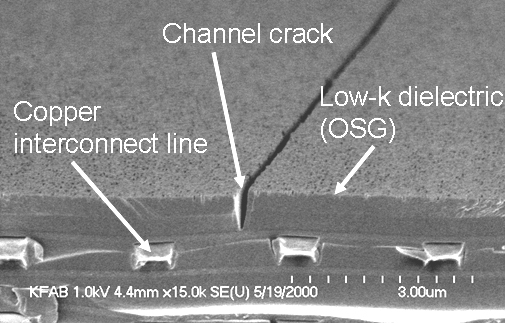 One of the most common forms of cohesive failure observed in brittle thin film subjected to a tensile residual stress is channel cracking, a fracture mode in which through-film cracks propagate in the film. The crack growth rate depends on intrinsic film properties, residual stress, the presence of reactive species in the environments, and the precise film stack.